There’s a distinct possibility that feeding my fish bird food is not the best practice after all. Another floater. I’m moving ever closer to the Tolerance Tank….this time it’s….NOOOOOOOOOOOOOOOOOOOO! O.M.G! No, please no! Oh…phew! It’s not Thor, folks! That’s a relief. 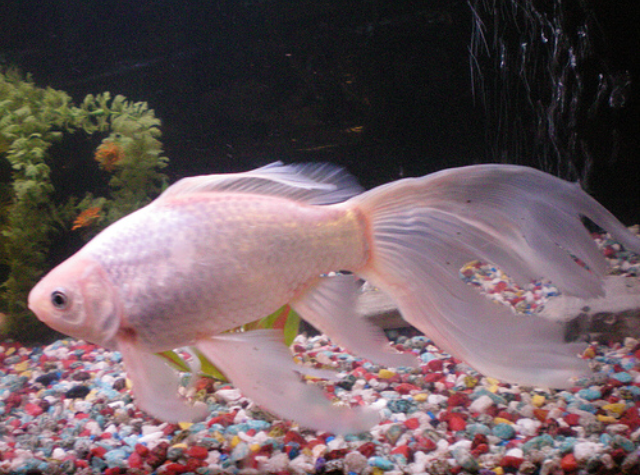 Thor with his creamy white shiny gills is as sweet as he is large. Let’s just say he makes a real impression when he enters a tankful of multicolored fish. Aquatic life rush over to my little guy. I’m guessing they think he may actually be a marshmallow. How precious is that? Thor…he almost looks like a marshmallow, doesn’t he? That’s why he appealed to my softer side. But, Awwww Nooooo……*Gently scoops a lifeless floating Pimp Daddy G off the top of the tank – employs 1-finger-fish CPR directly on the corian countertops* ….Breathe! Breathe! Breathe, dammit! Pimp Daddy G, come back to us! PIMP DADDYYYYYYYYYYYYGGGGGGGGGGGGGGGGGGGGGGGGGGGGGGGGGGGGGGGGGGGGGGGG! I did ‘t even see my child rushing into the kitchen to criticize watch. 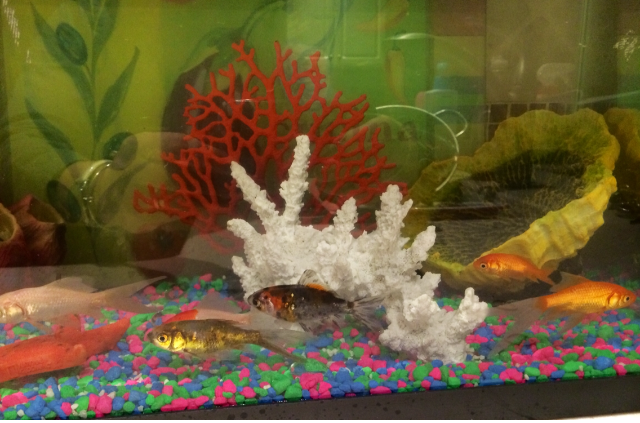 My beautiful gold Pimp Daddy Gangsta (shown swimming between Charmaine and Creamsickle – great! now I’m hungry! – The Stepford Wives meander throughout)…how gemtastic you made us all feel….or maybe not ALL of us…. Sure, his name was a bit provocative. He may have appeared a bit intimidating at first glance with his shiny gold coloring. He was but a gem among a grouping of slinky shimmering orange bursts of energy I like to call The Stepford Wives; and spotted tricolored twins named Tango and Ray, new recruits to the Tolerance Tank. He liked rap music and would add some rap to Frank Sinatra tunes. Pimp Daddy’s favorite, “New York, New York” was always a welcome treat among Tolerance Tank residents. 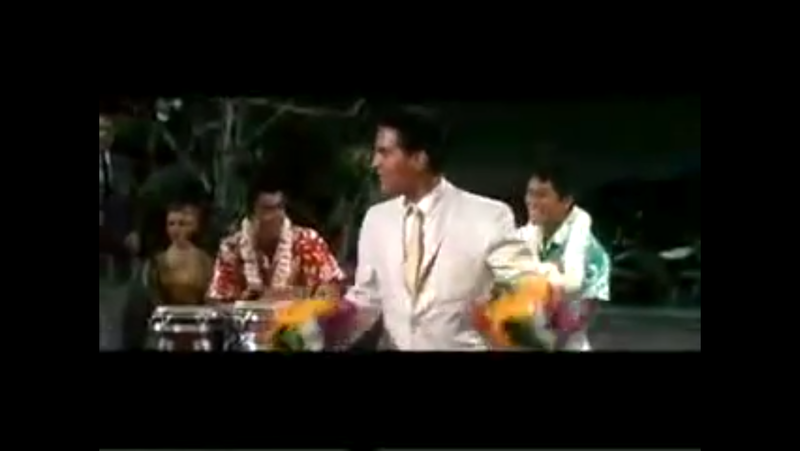 Once while hanging at a luau prior to his Tolerance Tank days, he amused a rather large crowd of haddock with his rendition of Elvis Presley’s tune, “Rock-A-Hula-Baby”, rap style, of course. And boy oh boy didn’t he have a way with the ladies! They were quite attracted to his brilliant gold coloring, I hear. Fisherman too had, on more than one occasion, grabbed at him as he was sleeping on the bottom of the sea. They’d taken him for a gold coin. Pimp Daddy Gangsta liked to rap to Elvis tunes. He often dressed like Elvis for Halloween parties. I miss PDG already, folks…. I must take issue with the Stepford Wives this day though. Did they even attempt to include Pimp Daddy into their weekly game of hide-and-seek-swimming at dusk? Did any of them lend an ear or give Pimp Daddy the respect he deserved as a talented musician, like Maria had prior to her….well….let’s just say for now, her…a…passing? When Pimp Daddy seemed slower, more cautious than usual in his final forty-eight hours did Thor (named paradoxically for his lack of masculinity in a tank full of difficult females) or Creamsickle (so named to represent my ice cream cravings; you got a problem with that?!) even give PDG the time of day? No. I watched. It appears that he had been counted out immediately upon dipping his fin into a tank almost full of sorority sisters. Maybe they’d heard about his “kind”. Perhaps they blamed him for the unfortunate death of our beloved “Maria”, resident samba swimmer. There is so much we still don’t know. Was it his name that set the Stepford Wives adrift from Pimp Daddy? Perhaps some of them stereotyped him prior to his ever joining them in the Tolerance Tank. Because Charmaine seemed most hospitable, allowing PDG (full name, Pimp Daddy Gangsta) to swim alongside her, I had wrongly assumed that he’d then had his ticket “in”. I was aware, though, that other Stepford Wives, Bobbie and Sarah, had issues with Charmaine and her attraction to the more deviant underwater Carassius auratus. Was it because he was originally from the city of Brookefin? Maybe the other Stepford Wives were jealous of their fellow sister swimmer’s ability to charm a “bad boy from da hood” as the wives called him all in fun. So I’d thought anyway. Is this some kind of a cover-up? Is what happened to sweet Maria, Samba Swimmer, related in any way to Pimp Daddy Gangsta’s untimely death? Where has Creamsickle been throughout all of this madness (My gosh I’m hungry)? Why is Thor staring out of the tank “window”? He appears heavy in thought (or stunned into silence??) Shouldn’t he be at the Fins Gym? He appears transfixed on something. Hmmmmm….could he…be…(gulp)…next? Or perhaps he’s afraid of the girls and their blatant dismissal of him as a feral male with creamy white skin and light eyes? Could he have had a crush on Pimp Daddy Gangsta himself? Charmaine maybe? Still grieving Maria? Might he be planning an escape of some sort? Or perhaps he’s unaware that his only male peer…Pimp Daddy G…is really gone. He could be spiraling into some kind of depressive disorder, OR maybe he offed Pimp Daddy G…! Friends, I shall keep you posted. I may need to send one of my undercover gill-bearing aquatic craniate animals down to the Tolerance Tank to get the real story. Reporting live from the kitchen, this is Jules giving you the latest waves in The Tolerance Tank. 1. If it looks like fish food but says it’s bird seed, don’t feed it to fish. 2. I was only kidding about number one. Who does that? 3. Don’t judge an aquatic animal by it’s fin hue (or shape). 4. Only the good become self-floatation devices young. 5. Tell those you swim among how you feel before they become a floater. No one “Rock A Hula” rap quite like PDG. I love this stuff!!! Sorry for the fish… Seriously. I’m sure it’s the sinister Stepford Wives! Bad girls! Signs do seem to point in that direction, don’t they? Something tells me that would be too easy…my money is on that mysterious Creamsickle…anyone else hungry? 😉 I like how you think!